The President of Germany, officially the Federal President of the Federal Republic of Germany (German : Bundespräsident der Bundesrepublik Deutschland),  is the head of state of Germany. Under Article 59 (1) of the Basic Law (German Constitution), the president represents the Federal Republic of Germany in matters of international law, concludes treaties with foreign states on its behalf and accredits diplomats. Furthermore, all federal laws must be signed by the president before they can come into effect, but usually they only veto a law if they believe it to violate the constitution. A veto is the power to unilaterally stop an official action, especially the enactment of legislation. A veto can be absolute, as for instance in the United Nations Security Council, whose permanent members can block any resolution, or it can be limited, as in the legislative process of the United States, where a two-thirds vote in both the House and Senate will override a Presidential veto of legislation. A veto may give power only to stop changes, like the US legislative veto, or to also adopt them, like the legislative veto of the Indian President, which allows him to propose amendments to bills returned to the Parliament for reconsideration. Frank-Walter Steinmeier is a German politician serving as President of Germany since 19 March 2017. He previously was Minister for Foreign Affairs from 2005 to 2009 and again from 2013 to 2017, and Vice-Chancellor of Germany from 2007 to 2009. He was chairman-in-office of the Organization for Security and Co-operation in Europe (OSCE) in 2016. The Federal Convention, also known as the Federal Assembly, is a special constitutional body in the political and federal institutional system of Germany, convened solely for the purpose of electing the President of the Federal Republic of Germany (Bundespräsident), either every five years or within 30 days of the premature termination of a presidential term. The Federal Convention mirrors the aggregated majority situation of the Bundestag and the parliaments of the 16 German federal states. As German constitutional law does not consider oaths of office as constitutive but only as affirmative, the president does not have to take the oath at the moment of entering office in order to be able to execute the powers of the office. The oath is usually administered during the first weeks of a president's term on a date convenient for a joint session of the Bundestag and the Bundesrat. Nevertheless, a president persistently refusing to take the oath could face an impeachment. If a president is re-elected for a second term, they do not take the oath again. It is also theoretically possible, albeit a drastic step which has not happened since 1949, that the president refuses to sign legislation merely because he disagrees with its content, thus vetoing it, or refuse to approve a cabinet appointment. In all cases in which a bill was not signed by the federal president, all presidents have claimed that the bill in question was manifestly unconstitutional. For example, in the autumn of 2006, President Köhler did so twice within three months. Also, in some cases, a president has signed a law while asking that the political parties refer the case to the Federal Constitutional Court in order to test the law's constitutionality. If the president dies, resigns or is otherwise removed from office, a successor is to be elected within thirty days. Horst Köhler, upon his resignation on May 31, 2010, became the first president to trigger this re-election process. Jens Böhrnsen, President of the Senate and Mayor of the Free Hanseatic City of Bremen and at the time President of the Bundesrat, assumed the powers and duties of head of state. Similarly, when Christian Wulff resigned in 2012, it was Horst Seehofer, Minister-President of Bavaria, as President of the Bundesrat, who assumed the powers and duties of head of state. 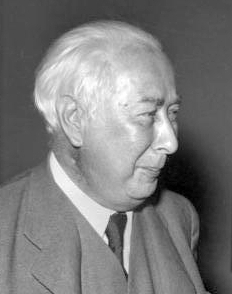 When Heinrich Lübke, on the other hand, announced his resignation in 1968, it only came into effect the following year, a mere three months before the scheduled end of his term and after the expedited election of his successor. Back in 1949 Karl Arnold, at the time Minister-President of North Rhine-Westphalia and President of the Bundesrat, also acted as head of state for a few days: after the Basic Law had come into effect and he himself was elected as President of the Bundesrat, the first President of Germany was not yet elected and the office therefore vacant. The Weimar-era presidential standard from 1921 was adopted again as presidential standard by a decision by President Theodor Heuss on 20 January 1950, when he also formally adopted other Weimar-era state symbols including the coat of arms. The eagle ( Reichsadler , now called Bundesadler) in the design that was used in the coat of arms and presidential standard in the Weimar Republic and today was originally introduced by a decision by President Friedrich Ebert on 11 November 1919. The position of President of Germany was first established by the Weimar Constitution, which was drafted in the aftermath of World War I and the abdication of Emperor Wilhelm II in 1918. In Germany the new head of state was called the Reichspräsident . The Weimar Constitution created a semi-presidential system in which power was divided between the president, a cabinet and a parliament. The president enjoyed far greater power than the current president and had an active political role, rather than a largely ceremonial one. The influence of the president also increased greatly as a result of the instability of the Weimar period. The president had authority to appoint the chancellor and could dismiss the entire cabinet at any time. However, it was also necessary for the cabinet to enjoy the confidence of the Reichstag (parliament) because it could be removed by a vote of no confidence. All bills had to receive the signature of the president to become law and, although he did not have an absolute veto on legislation, he could insist that a law be submitted for the approval of voters in a referendum. The president also had authority to dissolve the Reichstag, conduct foreign affairs, and command the armed forces. Article 48 of the constitution also provided the president sweeping powers in the event of a crisis. If there was a threat to "public order and security" he could legislate by decree and suspend civil rights. The Federal Chancellor of the Federal Republic of Germany is, under the German 1949 Constitution, the head of government of Germany. Historically, the office has evolved from the office of chancellor that was originally established in the North German Confederation in 1867. The Basic Law for the Federal Republic of Germany is the constitution of the Federal Republic of Germany. The Parlamentarischer Rat was the West German constituent assembly in Bonn that drafted and adopted the constitution of West Germany, the Basic Law for the Federal Republic of Germany, promulgated on 23 May 1949. The Cabinet of Germany is the chief executive body of the Federal Republic of Germany. It consists of the Chancellor and the cabinet ministers. The fundamentals of the cabinet's organization as well as the method of its election and appointment as well as the procedure for its dismissal are set down in articles 62 through 69 of the Grundgesetz. The election of the first President of the Federal Republic of Germany was held on 12 September 1949, following the first Bundestag election of August 14, 1949 and coalition talks/ negotiations between CDU/CSU, FDP and German Party (DP). The Reichstag was the Lower house of the Weimar Republic's Legislature. It originated in the creation of the Weimar Constitution in 1919. After the end of the Weimar Republic in 1933, the Reichtag continued to operate, albeit sporadically, as the nominal Legislature of Nazi Germany. ↑ "Basic Law for the Federal Republic of Germany". Gesetze-im-internet.de. Retrieved 2012-11-22. ↑ Haensle, Walter (2009). "Amtseid à la Obama – Verfassungsrechtliche Grundfragen und Probleme des Amtseids nach dem Grundgesetz" (PDF). JURA - Juristische Ausbildung. 31 (9): 670–676. doi:10.1515/JURA.2009.670. ISSN 0170-1452. 1 2 Grundgesetz für die Bundesrepublik Deutschland (in German). Article 67. ↑ Grundgesetz für die Bundesrepublik Deutschland (in German). Articles 67 and 68. ↑ Grundgesetz für die Bundesrepublik Deutschland (in German). Article 82. ↑ "Das Amt des Bundespräsidenten und sein Prüfungsrecht | bpb". ↑ "Bundespräsidenten: Das achte Nein". Spiegel Online. 2006-12-08. ↑ Bryde, in: von Münch/Kunig, GGK III, 5. Aufl. 2003, Rn. 7 zu Art. 81. ↑ "Das Amt des Bundespräsidenten und sein Prüfungsrecht" (in German). Bpb.de. Retrieved 2012-11-22. ↑ "Geschäftsordnung des Bundesrates" [Rules of Procedure of the Bundesrat](PDF). §7 (1). Retrieved 7 November 2016. Die Vizepräsidenten vertreten den Präsidenten im Falle seiner Verhinderung oder bei vorzeitiger Beendigung seines Amtes nach Maßgabe ihrer Reihenfolge. Ein Fall der Verhinderung liegt auch vor, solange der Präsident des Bundesrates nach Artikel 57 des Grundgesetzes die Befugnisse des Bundespräsidenten wahrnimmt. ↑ "Bouffier und Tillich vertreten Bundespräsidenten". ↑ "Interview zum Köhler-Rücktritt: "Das hat es noch nicht gegeben"". tagesschau.de. Retrieved 2012-11-22. ↑ Zentner, Christian Ed; Bedürftig, Friedemann Ed (1985). Das große Lexikon des Dritten Reiches (in German). München: Südwest Verlag. p. 686. ISBN 978-3-517-00834-9. ↑ "The Constitution of the German Federation of 11 August 1919" . Retrieved 2007-07-16. 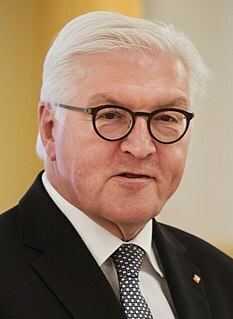 Wikimedia Commons has media related to Bundespräsident (Deutschland) .